We’d love your help. Let us know what’s wrong with this preview of Just Me and My Dad by Mercer Mayer. To ask other readers questions about Just Me and My Dad, please sign up. The special bond that a child has with dad is wonderfully portrayed in this heart warming book. I might be a little bias in my liking for this book because little critter books take me back to good memories from my childhood. My son has also picked up a liking for little critter and has a few of the interactive book apps on his Kindle Fire. He especially loves the little mouse that is hidden on most pages. “Just Me and My Dad” is special because little critter thinks he is taking care of his dad on a camping trip when in reality it is the other way around. I also appreciate the fact the da I might be a little bias in my liking for this book because little critter books take me back to good memories from my childhood. My son has also picked up a liking for little critter and has a few of the interactive book apps on his Kindle Fire. He especially loves the little mouse that is hidden on most pages. “Just Me and My Dad” is special because little critter thinks he is taking care of his dad on a camping trip when in reality it is the other way around. I also appreciate the fact the dad is shown being happy, busy, angry, loving, etc. Real dads display a variety of emotions and children tend to enjoy books with realistic characters. The illustrations are humorous and if you look closely, you can see the animals interacting with each other. I love Little Critter but this one isn't as strong as Just Me and My Mom. I love Litter Critter books. I remember reading a bunch of these when I was younger, so I enjoyed sharing this one with my daughter. This is a wonderful story about a child spending time camping with his dad. I love that they do several different things together. And I like how Little Critter tries to do things to help his Dad out, even if it doesn't go the way that he thought it would. And I like that even though things get messed up there is always something else they can do together instead. I think my favorite part is how Little Critter believes that he scared his Dad so he hugs him to make it better, when in actuality it is him that is scared and is being comforted. And like all Little Critter books, I LOVE the pictures and how well they capture the story. It is a funny and loving story focusing on a father/child relationship. And I think it is a wonderful book for children to share with fathers. I know my daughters will enjoy sharing this book with their dad.
" Just Me and My Dad" is one of my favorite Mercer Mayer books! I love this cute story, and I think it's important to have books like this in your classroom library because this could be a typical family situation. This book is simple, so it would be a great one to use for sequencing or even retell with a small group. I would recommend this book for children in kindergarten through second grade. We love all the little critter books! Just Me and My Dad was about a little boy and his dad’s escapades while on a camping trip and all the fun they had. The illustrations were well drawn and colorful. So good! I absolutely loved these little critter books! 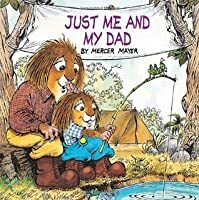 Just Me and My Dad (Look-Look) by Mercer Mayer follows a father son camping trip where Little Critter has a good time with Dad, despite some mishaps. Mayer's illustrations extend the humor of the story, with lots of expressive facial features. Children should enjoy the many animals pictured, including spider, cricket, snake frog, butterfly, raccoon, bear, fish, owl, chimunk, rabbits, and birds. My favorite images are driving off, wrong campsite, sunk canoe, fishing, eyes, and story. The text tells Just Me and My Dad (Look-Look) by Mercer Mayer follows a father son camping trip where Little Critter has a good time with Dad, despite some mishaps. The text tells one version of the story while the pictures convey the mishaps and fears of Little Critter. I thought the bear stealing the fish from the frying pan was not a good addition. Bears are to be feared, and smart campers would have left the area immediately and notified rangers or authorities. (I know it's just a story, but safety in the wild is very important!). I would definitely discuss this aspect with children. I dock a star for this. Otherwise this camping tale is fun, as is the relationship of Dad and son. The child point of view is very amusing and child centered. More fathers should be this involved with their children. 3 star rating. This book was used as a guided reading lesson. I had about 8 scholars in my group. They each read the book independently. We broke down sounds together when we chorally read. They answered an array of questions. Most of the questions were inference questions. Much of this storyline leaves out parts intentionally for "inference." I asked questions like "why couldn't the boy fix the tent?" "who was really scared at the end of the story though the text suggests that the dad was?" Have fun with it! This book was used as a guided reading lesson. I had about 8 scholars in my group. They each read the book independently. We broke down sounds together when we chorally read. They answered an array of questions. Most of the questions were inference questions. Much of this storyline leaves out parts intentionally for "inference." I also grew up with this book and loved it! This is the story about little critter and his camping trip with his dad. Many things go wrong like they lose their canoe,a have to move camping spots and even lose their dinner because a bear steals it but no matter what happens little critter loves the time that he spends because it is only him and his dad. LE: After the story have a discussion with the children about any trips that they have had with their parents like camping, beach trip, etc. After I also grew up with this book and loved it! This is the story about little critter and his camping trip with his dad. Many things go wrong like they lose their canoe,a have to move camping spots and even lose their dinner because a bear steals it but no matter what happens little critter loves the time that he spends because it is only him and his dad. A classic story that I remember from my childhood. Like many of my other favorite children's books growing up the pictures have so much detail you can find something new each time you look. I used to read this with my dad and we'd do stuff like fish together like in the book. I hope my future husband will read this with my children and my family can have a great experience with this book as I did. I would not necessarily put this in my future classroom. It just seems like a book you would want a A classic story that I remember from my childhood. Like many of my other favorite children's books growing up the pictures have so much detail you can find something new each time you look. I used to read this with my dad and we'd do stuff like fish together like in the book. I hope my future husband will read this with my children and my family can have a great experience with this book as I did. Just Me and My Dad is a wonderful book about spending the day with just Dad and the adventures they get into. It is a great story about feelings a little one might have about their father ie. disappointment, pride, fear and unconditional love. Mercer Mayer has published over 300 children's books and is possibly best known for his Little Critter and Little Monster book series. Mayer published his first book in 1967 and it was a wordless picture book. In 2007 Mercer Mayer was chosen to be the Nati Just Me and My Dad is a wonderful book about spending the day with just Dad and the adventures they get into. It is a great story about feelings a little one might have about their father ie. disappointment, pride, fear and unconditional love. Little Critter gets to go on a father/sun camping trip. He learns to fish for dinner and how to put up a tent. He makes little mistakes, but dad guides the way when putting the tent up. They also get to sleep under the stars. They spend lots of time together. I like this book because it shows the relationship between a father and his son. I could use this book to teach the children about having a relationship with their parent or caregiver. This book would fit great into a thematic unit about fa Little Critter gets to go on a father/sun camping trip. He learns to fish for dinner and how to put up a tent. He makes little mistakes, but dad guides the way when putting the tent up. They also get to sleep under the stars. They spend lots of time together. PB:44 Just Me and My Dad. One of my favorite Mercer Mayer books. The illustrations are so detailed and when you re-read the book agagin, you notice the little things like the spider and cricket on practically every page. It makes you go back to your childhood remembering the memories of just hanging out with your Dad which is more difficult to do when getting older. The book will simply make an older adult appreciate their Dad so much more! I recommend this to anybody! Its a story about a critter and his dad going on a camping trip the adventures as well as misfortunes are described in the story if you are not careful. The important lesson it teaches is while camping we are guests and forest is a place for animals and we have to respect it. Extension- the kids can have tents or even bring in a sleeping bag or their blankets and they can dress in their pj's and read stories and finger games and even take a nap. This was such a feel- good book! It would be a great book for a father to read to their son. Any little boy who reads this book with their dad is going to want to spend some quality time with them just like the characters within this awesome story. My son read this to me! Loves to find the spider and grasshopper! Cute book! Book Summary: In this addition to the Little Critter series, Little Critter goes on a Father-Son camping trip. He tries to be helpful by preforming all of the camping-related tasks by himself, but he ends up needing his Dad’s help anyway! Little Critter claims to be brave after telling his Dad a ghost story around the campfire at night, saying it is his Dad who is scared, but in reality, he is the one who needs the hugs and comforting! -Ideas: The relatable overarching theme of this picture book is the strong relationship between a father and son. Every page consistently has an example of the main character, Little Critter, and his Dad strengthening their bond by doing camping related activities together. -Presentation: The font in this book is clean, large, well-spaced and easy for young readers to read. Also, the pictures on each page directly correspond with the text on the page (or previous page). In this case, the pictures give away this might be more appropriate for slightly older primary grade students to discuss. -Conventions: The text in this story demonstrates proper use of conventions in both simple and complex sentences in the areas of punctuation, grammar, spelling and capitalization of the first word. -Voice: The narrative style of the text lends itself to the kind of writing a student in younger primary elementary grades would do when journaling about their own experiences. The words are chosen carefully by the author to make it sounds as though a young child is telling the audience his own account of the camping trip. Classroom Integration: As I mentioned above, teachers can use this book to teach a lesson in older primary elementary grades on how to use picture clues to figure out something extra that the text is not directly saying. The class can explore how the words differ slightly from the story the picture tells and try to determine the answer to the question, “Who is really afraid”? For even younger elementary students who might not understand the inferences concealed within the illustrations, this book could serve as a prompt for a writer’s workshop about what activities they like to do with their fathers or father-like figures in their lives. My husband and i grew up with these books, and most of the copies I read to my toddler happen to be the very ones my younger siblings scribbled in from my parents library. I love the nostalgia they represent, but as a parent now I sometimes take issue with Little Critter's less than ideal behavior. Mercer captured a child's petulant personality perfectly in each of these stories. Little critter child always insists on being right and is annoyingly quick to justify his conclusions with snide equi My husband and i grew up with these books, and most of the copies I read to my toddler happen to be the very ones my younger siblings scribbled in from my parents library. I love the nostalgia they represent, but as a parent now I sometimes take issue with Little Critter's less than ideal behavior. Mercer captured a child's petulant personality perfectly in each of these stories. Little critter child always insists on being right and is annoyingly quick to justify his conclusions with snide equivocations. The later editions take on a more moralizing tone, while the earlier editions are nonapologetic in their portrayal of the adventures he faces growing up. I think this book is my personal favorite of the 10 Little Critter books in our current library, and my reasoning is because in this book he is actually working alongside his dad to have a successful camping/father-son bonding trip, rather than engaging in his usual internal monologues on how his parents are messing up his plans. My baby loves the repetitive spider and cricket (sometimes mouse) friends that are hidden on each page, it gives him something else to focus on other than the story. I love adorable picture books. So this little beaver goes camping with his father, and the illustrations show the humorous nature of the narrator's inability to share all of the details accurately. The illustrations offer the students an opportunity to narrate the "real" story in comparison to the narrator's story. I especially love the page when little beaver tells his dad a ghost story, and "Boy, did the dad beaver get scared!" Hint: the illustration shows the father clearly indulges his son. A sweet tale about a boy and his dad going camping together. Cleanliness: mentions telling ghost stories. **Like my reviews? I also have hundreds of detailed reports that I offer too. These reports give a complete break-down of everything in the book, so you'll know just how clean it is or isn't. I also have Clean Guides (downloadable PDFs) which enable you to clean up your book before reading it! Visit my website: The Book Radar. I began illustrating books in 1966. Since that time I have published over 300 books. Most of my books are about things that happened to me when I was a little kid. Now I'm a big kid and I write about things that happen now, especially with my own children. They always remind me of what it was like. I was born in Arkansas in 1943. Boy, that was a long time ago! It's real fun to be an old kid. Then m I began illustrating books in 1966. Since that time I have published over 300 books. Most of my books are about things that happened to me when I was a little kid. Now I'm a big kid and I write about things that happen now, especially with my own children. They always remind me of what it was like. I was born in Arkansas in 1943. Boy, that was a long time ago! It's real fun to be an old kid. Then my parents moved to Hawaii when I was thirteen years old. After High School, I went to Honolulu Academy of Arts. Then I moved to New York City. My wife, Gina, and I write the Little Critter stories together.